Scalia is a new best selling multi-concept WordPress theme on themeforest, which comes bundled with five unique design templates for making websites of any purpose: corporate, blogs, eCommerce, niche, portfolio, news. Well, there are so many great multi-puprose themes on the market, so the big question is: what makes Scalia different? Designed in a modern flat style with pleasant colour scheme, this style is a general all-rounder concept, aimed first of all at business/corporate projects, portfolios and has multipurpose nature. This design suits perfectly the needs of agencies, which prefer to build compact but attractive websites, where all information is placed just on one page. It will also work great for mobile-apps presentation websites as well as landing pages. This concept is made for using in eCommerce stores on Woocommerce. With an ultra-elegant design, this concept allows you to sell your products in style. Large images, big fonts, colorful labels and slogans, galleries, contact form etc. – everything you might need to build a landing page that works for you. And on top of this – stunning parallax effects. Another Scalia’s child theme is made for using as personal blog. This child has a stylish urbanistic look with combination of ultra modern and classic fonts, almost monochrome color scheme with black and white images. With over 150 pre-configured ready-made page layouts, Scalia is the most complete premium WordPress theme on the market. Scalia was built with one major thing in mind: simplicity. You don’t need to waste your time on inventing your own layouts – just take any of this 150 beautiful pages and copy-paste your content. Scalia offers an extensive set of options, widgets & features to help you get started within minutes. But the most exciting feature of Scalia is the number of content elements (shortcodes) included. Check the “Elements” menu option on Scalia’s main demo website to see why. 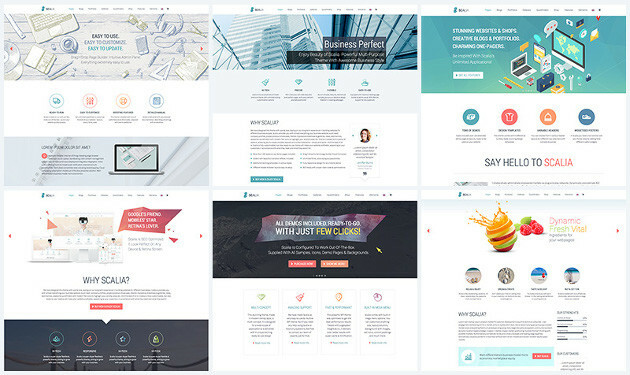 With impresive 50+ shortcodes this theme provides you with everything you can imagine for using as content on a corporate, portfolio or whatever website. In addition, each of these shortcodes has several options and styles, so you can be sure you will find the best look for your website page. In order to make all this easy-to-use, Scalia includes the latest version of Visual Composer, where you can create your pages in frontend mode by drag’n’dropping & combining content elements with each other. 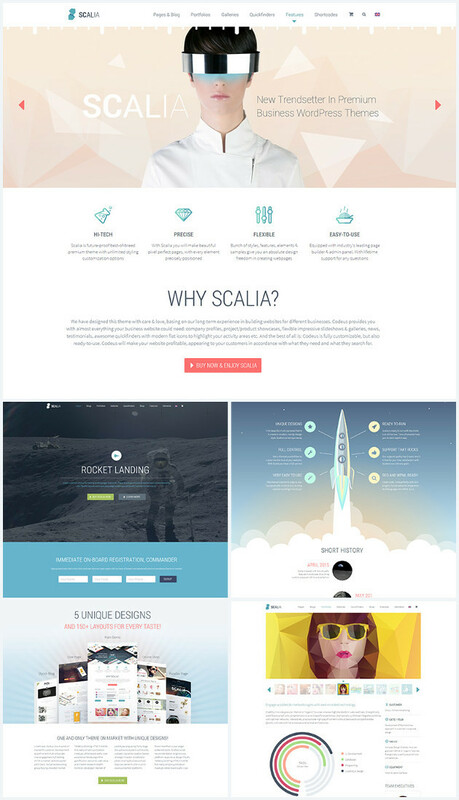 On it’s selling page on themeforest Scalia is claimed to be a theme with unlimited customisation options. By checking its theme options in backend you will see, that it is true. You can indeed change everything in design of your website. Beginning with general website layout and CI settings, fonts and colors for any website element, backgrounds etc, even including such details as border radius of boxes. Scalia gives you a huge number of ways to customize your website, allowing you to completely overhaul the demo content and build the website you want. Another very interesting features of Scalia is Home Constructor. With this feature you can create your homepages by combining absolutely different post types of Scalia on one page. Let’s say you wish to include several different pages and blog posts in your homepage, mix it with news or latest portfolios, adding some client carousels etc. – all this can be easily done vie drag’n’drop Home Constructor in theme options. Thanks to a large variety of additional options you are absolutely free in your decisions, what would you like your page be look like. Fancy title areas in different styles, slideshows, portfolios and galleries with plenty of display settings, blog lists in different layouts, flexible customizable sidebars and much much more – with all this stuff you are all set to launch any great-looking website. Scalia’s documentation is most detailed theme documentation on the market. All settings, options, features, functions are described in understandable way with a lot of screenshots, examples and step-by-step explanations. The documentation is built not for wordpress professionals, but also for wordpress newbies, covering general editing aspects as well. 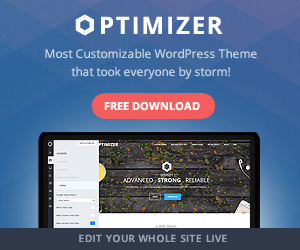 By checking Scalia’s comments and support forum on themeforest as well as theme’s rating you will see, that support quality of this theme is top-notch. Third best rated corporate theme on themeforest, plenty of five stars ratings praising support quality of Scalia – yes, it looks very impressive. If you do experience problems, the developers offer quick support for any questions asked via the ThemeForest comments section. This will help you extract the full potential from the Scalia theme. Scalia is a really great theme. It’s visually stunning, impressively versatile, and supports a huge depth of functionality – what more could you want from a theme? Kontramax is a lead webdesigner by CodexThemes. With his team he develops premium wordpress themes, useful flash & vector mockups and he is a passionate kontrabass player. Last year he was announced as Envato's superstar. Follow Kontramax on Twitter and Facebook. Today we would like to offer you to participate in this great giveaway and take a chance to win 1 of 3 Optimizer Ultimate Licenses! This theme looks amazing. I wonder how it stacks up to avada, bridge or jupiter in ease of use. The theme is amazing! But one question i have that what you will prefer for me if i used to design for my website, which looks unique ..
é bonito, mas muito complicado de mexer, nao compensa. Such an Amazing Theme really love it. Thank you so much for sharing.